Preparing the right diet plan, giv﻿﻿i﻿﻿﻿n﻿﻿g th﻿﻿﻿﻿em a balanced dog food, walking them daily, taking them to the vet for regular check ups — dogs are a gem and these are only some of the ways you can do to keep your dog safe and healthy. However, we must not forget one more factor and that is sleeping. You must also ensure that your dogs are getting the best sleep every night. One way of doing that is by getting them elevated dog beds. They’re comfy, they’re smart and they provide a multitude of benefits such as temperature control and support. With that being said, here are the best elevated dog beds for the year. This elevated dog bed will work best with dogs that are not that large. This product is made out of PVC but can support as much as 100 pounds and its frame is high strength. Moreover, this elevated dog bed comes with the cordura fabric which has the capability to resist against abrasion. It has the same durability as a canvas. One thing I also liked about this product is that it is available in a variety of colors such as burgundy, khaki, and forest green. This Kuranda elevated dog bed is also very easy to clean. 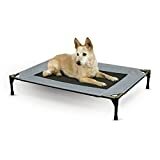 This bed also does not possess any holes on the four corners so this ensures you that your dog will not have any chance of snagging on those holes. Much like the first one, the Pawhut Dog Bed is more specifically designed for smaller sized dogs because of its size. However, what is really good about this is that it is made out of strong steel so this makes this product really durable. Unlike the first one, this product only comes in two basic colors which are red and blue. Moving on to the specifics and features, one of the things I loved about this elevated dog bed is the fabric used. It comes with a breathable mesh that allows for efficient ventilation. This is especially helpful during the warm months. This dog bed is also equipped with the ability to resist things like mold and mildew. Moreover, this dog bed is also very easy to clean. You can simply use a hose and a soap bar to wash this. The K&H elevated dog bed comes with a mesh center. This allows for your dog to stay cool during the warm weather. More than just this, the fabric used is a 600 denier fabric canvas and is also waterproof. The feet of this elevated dog bed is also made out of non-skid rubber. As for the size, this product is available in two options which are medium and large. This means that whether you have a Chihuahua or Golden Retriever, this model will be just as compatible with your dog. Moving on to its durability and mobility, this product has been tested and can support up to 100 pounds. Moreover, it also has a really simple design so it will not that be difficult to take it apart into pieces and reassemble it. The HDP elevated dog bed is one of my top picks for a number of reasons. First of all, the fabric that this dog bed comes with is heavy duty. It is made to resist water and made out of oxford material. More than just this, this elevated dog bed has also been designed to resist rust. After all, its frame is made out of powder coated steel. I also love that the HDP elevated dog bed comes with additional padded support. This ensures a good sleep for your dog. Moreover, the HDP Elevated Napper Cot is also very easy to take apart into pieces and put back together. 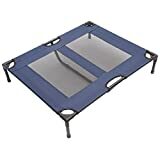 This makes it an ideal elevated dog bed to be used when going out for camping or any outdoor activity. One of the reasons why I consider this as one of my top picks is because it works well with both larger sized dogs and the much smaller ones like toy breeds. After all, the Coolaroo Elevated Dog Bed can support up to 100 pounds. I also liked the fabric that this elevated dog bed comes with. The fabric used is an HDPE knitted mesh. This fabric allows for good ventilation and efficient circulation of air. Moreover, this product also comes with a frame that is made out of steel which ensures that this product is strong enough to withstand large weight. This product is also the most affordable one in the list. One of the most important factors you have to take into consideration will be the materials that the manufacturing company used to make the product. To make sure and be certain that your elevated dog bed will support the weight of your dog, the ideal material that should be used for the frame of the bed would be steel or aluminum. This is because naturally PVC or the one of the most common plastic polymer do not have the amount of strength that metals like aluminum or steel have. However, if your dog is small or it’s a toy breed like a chihuahua, then you may opt to use elevated dog beds made out of plastic polymer or PVC. Just make sure that your chosen elevated dog bed will have the capacity to support the weight of your dog. Just to be certain, I recommend that you choose an elevated dog bed that has a high maximum weight. The fabric used is another important factor to consider. Most manufacturing companies use strong mesh fabric for their elevated dog beds. It is best that you choose an elevated dog bed that comes with a fabric that has a tight and firm weave. This is to ensure that potential snagging things such as the collar tags and the nails will be avoided and prevented. The mesh has to be wired across the frame of the bed to ensure enough support and for the prevention of occurrences like sagging to take place. Next factor we will talk about will be the size and height. Comfort is one of the benefits we want our dog to have when choosing the right elevated dog bed for him or her. One of the ways to ensure this is to make sure that the size of your chosen elevated dog bed will be proportional to your dog’s size. To check if they are proportional with each other, make sure that the legs of your dog will not be hanging over the frame when he or she is laying down and curled up. Aside from the size, there is also the height to consider. Make sure that the height of the bed is not too low or too high for him or her. To know if the height is just right, your dog should be able to get off the bed without any difficulty. When buying an elevated dog bed, you need to take into consideration the fact that you will need to maintain the product and clean it regularly. For this reason and more, you need to make sure that your chosen product will be easy to clean. One thing you have to check before buying is the background of the frame and canvass. Can they be washed with the use of detergents and water without causing any harm to the materials of the bed? Generally, dog owners take their pets to different places such as camping, for example. For this reason, you need to make sure that your chosen elevated dog bed is portable enough to be taken anywhere. It has to be light and not difficult to put together. If you plan to take your dog outdoors, whether most of the time or just to be sure, opt to get a weatherproof elevated dog bed. To ensure safety, make sure that your chosen bed does not have holes on the corners. Some dog beds have frames which have a hold on all four corners of the bed. This may pose a danger to your dog’s safety. This is because the feet of your dog may get snagged on these holes. Instead, try to look for a dog bed that possesses a uniform fabric around the frame. If you are having some doubts and second guessing whether you should get an elevated dog bed, I have rounded off some of the benefits that an elevated dog bed will provide. Just like us humans, sleeping on the floor poses different health issues. For dogs, this may cause pain in the pressure points of the body such as the hips and elbows. Every time that your dog gets up from the floor and does the opposite, those said points get in contact with the surface of the floor. This can lead to sores or calluses. By getting your dog to sleep on the elevated dog bed, your dog will have a better sleep. As an example, if it is during the cold months, your dog stays warm because he or she is not sleeping on the floor. And if it is during the warm months, your dog stays cool because the design of the elevated bed lets the air circulate back. And the winner of this review roundup is Kuranda Walnut Chew ﻿﻿Proof ﻿﻿Raised Bed. This elevated dog bed, first of all, is sturdy and durable. Sure, it is made out of PVC. However, it can support up to a hundred pounds and the PVC used is of high strength. As for the fabric used, this elevated dog bed comes with a cordura fabric. This fabric is equipped with the ability to resist abrasion. Furthermore, this elevated dog bed is also very easy to clean. It is also available in multiple colors and designs. Lastly but certainly not the last, I love that I can ensure the safety of my dogs since this dog bed does not come with any of the holes on the corners.